In the wake of the success achieved by the Elite 6150 model, the Manufacture Zenith is enriching the same collection with a new chronograph equipped with the prestigious El Primero movement. 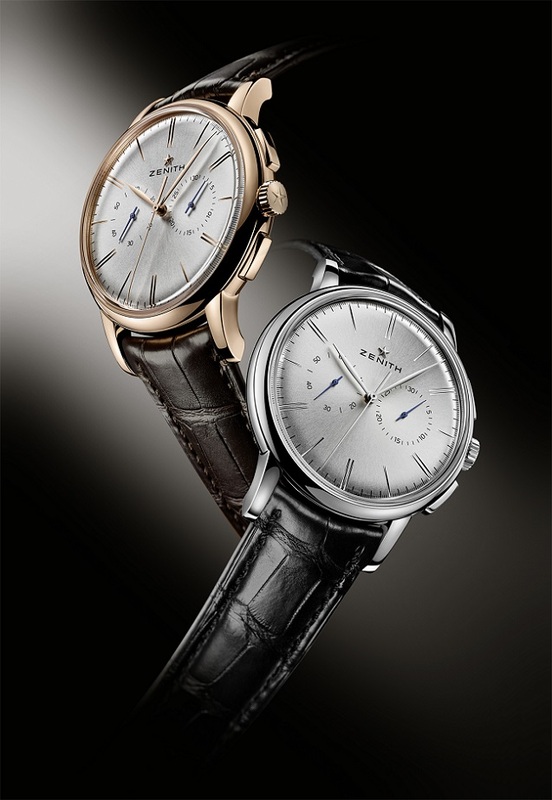 In a subtle blend of classicism and modernity, the Elite Chronograph Classic beats at the high frequency of El Primero Calibre 4069. Its finely curved 42 mm steel or rose gold case frames a restrained dial featuring engraved hour-markers and slender leaf-type hands. Its pulsating heart is a legend. Its pure, restrained design epitomises contemporary elegance according to Zenith. Beating at the rapid pace of El Primero Calibre 4069, the Elite Chronograph Classic model features taut lines conveying timelessly understated elegance. This apparent simplicity conceals a wealth of perfectly mastered expertise expressed through each distinctive detail. Available in stainless steel or pink gold versions, the ultra-thin 42 mm-diameter case features a characteristic pebble shape, enhanced by a fluted crown and rectangular pushpieces. Its flowing curves are underscored by ergonomic lugs ensuring a perfect fit on the wrist. The case is water-resistant to 50 metres and its alternately polished and sandblasted back is fitted with a transparent sapphire crystal enabling one to admire the fascinating mechanism of the El Primero Calibre 4069 and its openworked oscillating weight, adorned with the Zenith star. On the display side, the silver-toned dial provides hours, minutes, small seconds and chronograph indications, swept over by slim facetted hands. The cambered sapphire crystal, glareproofed on both sides, ensures optimal legibility, while a stylised hour-markers engraved on the domed dial create a trompe l’oeil depth effect. Fire beneath the ice! While the Elite Chronograph Classic displays a deliberately restrained appearance, its heart beats to the frenzied pace of a speed-racing machine, the legendary El Primero movement. A direct descendant of the world’s most precise series-made chronograph produced by Zenith in 1969, the automatic El Primero Calibre 4069 perpetuates the key assets of its legendary heritage: its integrated column-wheel construction and its exceptional rhythm of 36,000 vibrations per hour guaranteeing tenth-of-a-second precision. A rubber-lined alligator leather strap secured by a triple folding clasp sets the ultimate touch of refinement to the Elite Chronograph Classic, a timepiece designed for refined aesthetes… with a fiery temperament!